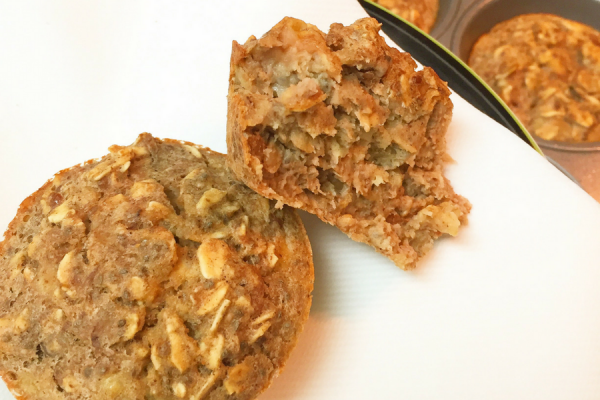 Not your typical banana muffins! Made from wholesome ingredients like bananas, almond milk, eggs and oats, they also get a flavor bump from the walnuts, chia seeds and maple syrup. Bring these to your next get-together, and you’re sure to impress! Mash two bananas in a medium bowl. Add almond milk, eggs, vanilla, chia, maple syrup and cinnamon. Mix until well combined. Add oats and oat flour to wet mixture. Mix well and let sit for 5-10 minutes. Add walnuts. Pour into muffin tin and bake for 22-24 minutes. Let cool.